So we have to decarbonize the world’s economy by 5.1% a year from now until 2050 just to keep the average global temperature rise to 2°C. That’s according to the recent PriceWaterhouseCoopers report, Too Late for Two Degrees? I’m trying to reconcile that factoid with the cries for adaptation planning that have flooded the blogosphere since Hurricane Sandy flooded New York’s subway system. Without serious and immediate cuts in greenhouse gas output, the push for adaptation is just a sophisticated form of denial. It denies the scale of the situation. It denies that we have to alter the way we live. It denies that we must stop the problem at its source, which is burning oil, coal, and gas. Adaptation works only if we stop adding more fuel to an already overloaded dynamic. The more carbon in the atmosphere, the more energy is trapped, and the more trapped energy, the more unstable the weather. Business-as-usual keeps us on a path for as much as 6°C (11°F) of warming, according to PwC. That’s consistent with other estimates I’ve seen. NASA’s Goddard Institute for Space Studies says that the average global temperature has gone up 0.8°C since 1880. Zero point eight. 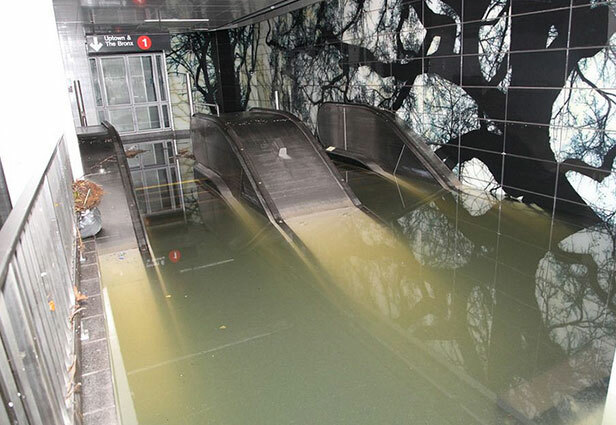 That tiny increment amped Sandy enough to turn the South Ferry subway station into an aquarium. Think of the atmosphere in thermodynamic terms. We’ve saturated its capacity to hold energy; now it’s trying to shed it. But because we’ve blanketed the globe with extra CO2, the excess energy can’t escape into space anymore. So that energy stays directed inward, like heat in a, well, a greenhouse. We might adapt to a 2°C world if emissions were under control. Even so, the risk of malinvestment is extreme. We’d have to anticipate a host of unmeasurable targets. How high should New York build a sea wall or a floodgate? The estimated average height of the sea in 2050? The estimated peak height? Will the peak be driven by another Category 1 Sandy, or by a Category 5 Katrina, or by something worse? What about in 2100? What about every other coastal city? Will London’s floodgate on the Thames function when sea level is a foot higher? Will hurricanes show up there, too? And what about other effects of climate change? Adaptation planning assumes linear extrapolations of current conditions. The chief feature of an unstable system is unpredictability. Dynamic behavior under stress is nonlinear. The risk of discontinuities—abrupt, fundamental changes in function—is high. Think of an overheated engine or circuit. Each works predictably until the instant their functional mode abruptly changes to failure. Drastic shifts in weather patterns will drive food shortages and damage infrastructure. The world economy can’t function if food is unreliable, and that will compound the problem in a nasty feedback loop. Less money means less investment, leading to inefficiency and yet less money to invest, and on and on in a descending spiral. This doesn’t even factor in the psychology of such a scenario. It wouldn’t be conducive to peace, let alone cooperation on the most capital-intensive engineering projects in history. Climate Progress lays out the case for investing in prevention rather than adaptation in this recent post. Even without considering the risks, CP demonstrates the truth behind the old maxim, an ounce of prevention is worth a pound of cure. Or in the case of climate change adaptation, a few tons. Planning to adapt to a 2°C world is like planning to adapt to a permanent state of war. Planning to adapt to a 6°C world is like planning to adapt to another Chicxulub asteroid. There’s very little New York or any city can do to anticipate the scale and severity of future climate change. Investing in adaptation without controlling the source of the problem—fossil fuel emissions—is just throwing good money after bad. All resources should be focused on reducing carbon emissions as much and as fast as possible. Prevention is the first, only, and best hope to keep NYC, the rest of America, and the world from sliding into a reality-based version of Mad Max meets Waterworld.